I just returned from a wonderful long weekend in New York City and my cup overflowth with fashion inspiration. I packed for some chilly, windy Fall weather only to be completely surprised by utterly perfect warmer Fall weather. 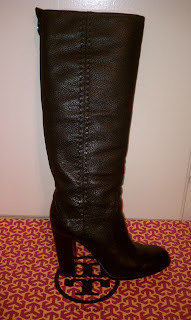 Besides, this LA girl would rather be warm than cold ;) In making NYC wardrobe choices to pack, I felt it a crime to not bring along my ‘Wyatt’ boots from Tory Burch. In fact, I felt I needed to step up my airport style so, I wore them on the flight there and back. I got these almost a year ago, but I remember it like it was just yesterday. :) While most of the country was still stuffed from dinner and underslept in a crazed store for those incredible Black Friday sales at the crack of dawn, I was glued to my computer pouncing on my Shop It To Me daily email. Yes, it’s quite an uplifting daily experience that I highly recommend. ;) These gorgeous knee high boots were a complete steal for $175, reduced from their $550 retail price. So you know that as soon as I could type my credit card number in correctly, I was doing my happy dance in my pjs. I got them about a week later and could not be more pleased. The boot is most DEFINITELY soft. It’s a pull on boot, my first ever. 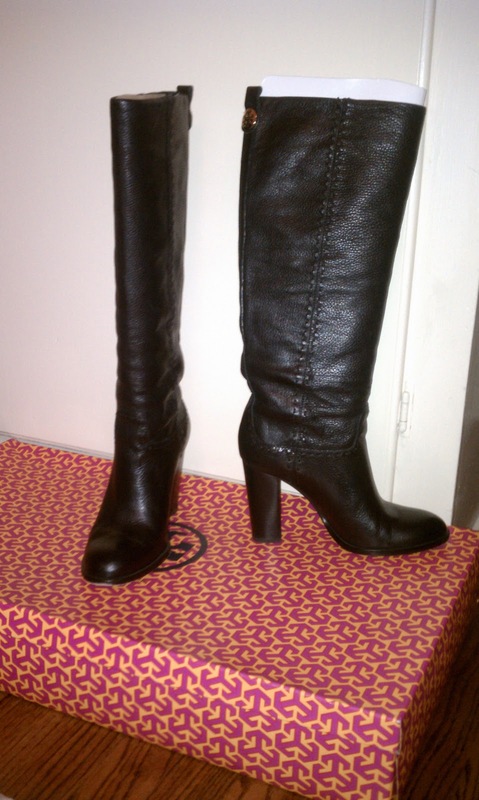 I was nervous that they wouldn’t fit over my calves since I’ve always struggled slightly with boots in that area. 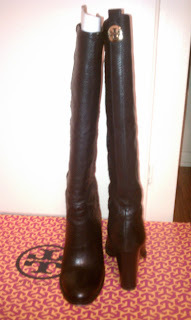 I’ve never been a fan of most pull on boots because they’re usually made of a material that always looks cheap to me. Even in the picture. And that’s just not my style. So these looked SO expensive, partly because they were originally. ;) But more than that, they looked substantial but not stiff. Granted it was just a picture I based this all off of but I figured the deal was too good not to take a chance and return if need be later. I really love them. They have a very molded foot that brings such a massive benefit to your toes. The benefit is that the molded foot keeps your foot from sliding all the way forward squishing your toes because 3 ¾” heels will do that to your toes. 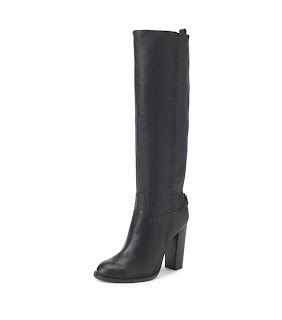 :) The stacked heel is solid. And by solid I mean that when the first leg of my flight was late and the airline shuttled me across the tarmac to catch my connecting flight VIP style and I had to climb the crazy spiky metal stair case with my two carry-ons, I didn’t stumble once. The boot’s construction gave my foot enough support to have unsquished toes but enough mobility at the ankle to have the agility of a supergirl. :) And the little gold iconic Tory Burch logo on the back just dot the ‘i’ in fierce, which is how you feel in these boots. The rounded toe gives it its timelessness and classic feel. The tailored shape worried me that it may give me a "cankle" look. But surprisingly, the slouch at the ankle is anything but... The fit is a perfect snug that doesn't slide down but still let me pull them off quickly at the airport security line. The foot pad isn't terribly well padded. But to resolve this, I usually wear my boots with ankle socks for the cushy softness they add. It makes them wearable for my cross country flight and a night walking around Times Square, dinner in Hell's Kitchen, a jaunt over to Bryant Park, the New York City LIbrary, a quick stop at Magnolia's bakery for cupcakes, admiration of Rockefeller Center pre-tree lighting, St. Patrick's Cathedral and Penn Station. Truly inspired by the amazing fashionistas all over New York City with their chic boots everywhere, made me want to find more delicious boots like the ‘Wyatt’. It doesn’t hurt that Ms. Tory Burch also keeps turning it out with fabulous shoes, boots, flats, bags and clothes. ;) Thanks NYC ladies! I'm drooling over those boots. I can't believe you found a pair of Tory boots for just $175! They look so luxurious. Gotta love Shop It To Me. Looking forward to your blog and your tweets! @mockoff I know, I've been SO lucky with the finds on Shop It To Me... such a godsend! Gorgeous!! They look as good as new, even if they are from last year. Very jealous of the boots, your trip to NYC and especially your stop at Magnolia Bakery, which is my FAVOURITE! And Magnolias... so glad we don't have one here because I'd be 20 lbs heavier!!! LOL! Just found your blog and have "lost my mind" several times over it! Lol! This is wonderful and I will certainly follow you! Thanks for bringing a wonderful, fun and informational blog to the addiction of shoes...:: It's Utterly FAAAAAHBULOUS!